For customers requiring information to be represented geographically or spatially we are able to offer a variety of interactive mapping solutions and applications. With all our interactive mapping solutions we can offer advanced search functionality. For example we could allow your website users to request to see a map of all your store branches within a set distance from their post code. The map would refresh appropriately zoomed displaying the filtered locations as pins. Another example would be to allow the user to filter which type of location is displayed on the map. We are able to provide completely bespoke mapping application development for customers with specific requirements. Developing the mapping system from a central code base on our servers allows us to include advanced backend CMS features allowing administrators to tailor the map specifically to their visual and functional requirements on their website. Other possibilities include allowing for routes or areas to be highlighted on the map.Where we build the graphical map we are able to change the legend, stylise the appearance of the map and choose which layers of information to include. The map can be customised around the design and layout implemented on your website. Bespoke maps can also carry your own brand, fonts and colour pallet. 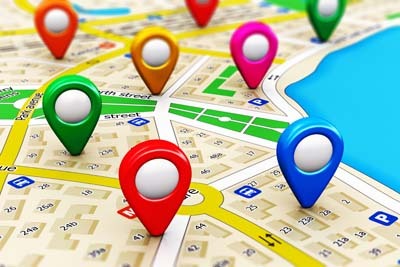 Choosing the right Mapping Solution for your website depends on how much direct management you require of the map presentation, data and content and if you have a requirement to publish multiple maps across a number of websites, web pages and devices. Please contact us to discuss your mapping requirements. We can arrange for a specialist to discuss your needs and arrange for mapping demonstrations. Methods to add the mapping coordinates through your CMS include usage of Post Codes or Longitude and Latitude.